A simple fruit salad brightens any menu regardless of the season. 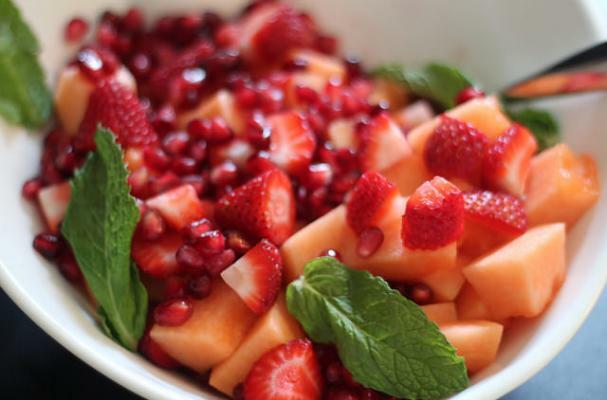 This beautiful salad featuring cantaloupe, strawberries, pomegranate seeds, and mint is tossed with an easy dressing of lemon juice and honey, both of which add an unexpected burst of fresh flavor. This easy salad is perfect for picnics, outdoor barbecues, or as a simple side to any meal. In a small bowl add lemon juice and honey and stir to combine. Place fruit and mint leaves in a bowl, pour in lemon honey dressing and gently stir until combined. Garnish with a few mint leaves and serve.